The chosen few who made it-and the many who only dreamed of it-find themselves as teammates and contemporaries. The result is golden. Entertaining, engaging, funny, and heartwarming, Big League Dream, with the Foreword written by Bucky Dent, is Roy Berger's nostalgic paean to a game he loves and grew up with in a time when heroes were untainted and true blue. Through his attempts to play ball again on the fantasy camp circuit, Berger met, talked to, and shared beers with players who had touched greatness and who had played with others now enshrined in Cooperstown. 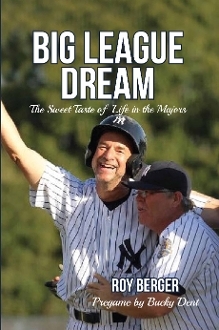 Big League Dream is the next-best thing to sitting down with Maury Wills, Bill Mazeroski, Mudcat Grant, Ron Swoboda, Fritz Peterson, Kent Tekulve, Jake Gibbs, Steve 'Psycho' Lyons, 'Big' John Mayberry, Chris Chambliss and other greats of the game from the 1950's, '60s, '70s, and '80s, and hearing stories few-if any-have ever heard. A business executive by vocation but a writer by instinct, Berger has a talent for putting people at ease and letting them talk. Big League Dream is the result.